Senegal coach Sergine Saliou Dia says he is glad to have made early progress at the Under-23 Africa Cup of Nations. 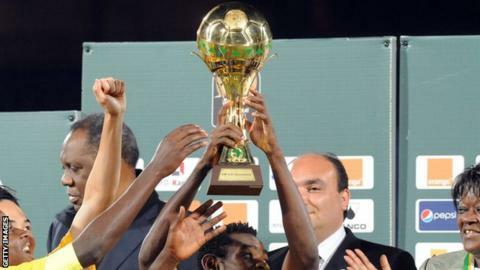 The hosts clinched a place in the semi-finals with a 2-0 win over Tunisia on Tuesday, while Zambia are out of contention after losing 3-2 to South Africa in the other Group A game. The top three at the tournament qualify for the 2016 Olympics in Rio. "It was important that we secure our place in the last four very early," Dia said. "I am really happy with my teams performance. "We always we work on the mentality of the players because they need to be mentally sound heading into matches like the Tunisia game. "Now we should continue to work hard and concentrate more because I still believe we're yet to achieve our target for the tournament. The victory was set up by a stunning goal by Belgium-based defender Ibrahima Diedhiou who unleashed a ninth-minute shot from the centre circle that flew over goalkeeper Sabri Ben Hassen into the net. Ben Hassen was beaten by a similar long-range shot from Zambia's Ronald Kampamba on Saturday. Substitute Mouhamadou 'Habib' Diallo assured Senegal of victory with a close-range strike off a cross five minutes from time. The win assured Senegal of winning the group and a place in the semi-finals of the tournament, no matter what happens in their final game against Zambia on Friday. Earlier South Africa survived a nervous finale to defeat Zambia 3-2. Conlyde Luchanga volleyed Zambia into a 1-0 half-time lead on 35 minutes not long after a brilliant tip over from South African goalkeeper Jody February prevented Benedict Chepeshi scoring. The South Africans were a transformed side after the break and scored three times within eight minutes for a 3-1 advantage. Menzi Masuku held off several challenges to level and Gift Motupa bagged a brace, heading home from close range, then firing past Zambia goalkeeper and captain Toaster Nsabata. Motupa had missed South Africa's opening loss to Senegal as he was playing for his club Orlando Pirates in the second leg of the Confederation Cup final. Billy Mutale punished sloppy South African marking at a corner with 17 minutes left to trigger a tense climax. The result means that Zambia are unable to progress to the semi-finals while South Africa know that a draw with Tunisia in the final group game on Friday will be enough for them to advance, thanks to the number of goals scored.